Week 21 Challenge - Male Theme & Blog Hop! Welcome to Friday and 2, yes 2 Polkadoodle challenges! This week its going to be a bit different - we still have our regular challenge but we also have a blog hop which is also part of the challenge!! And you know what that means - LOADS of candy whoop whoop!! 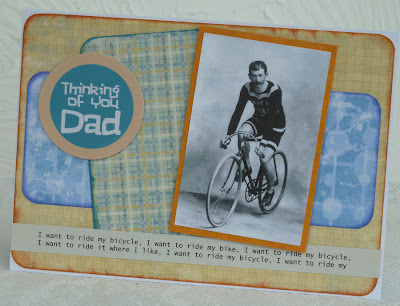 CHALLENGE 1: Now, we know not everyone like to do a hop for whatever reason, so we still have our normal challenge for the week which is MALE themed - you must make a card which is just for a man and you MUST include 1 button and a circle. We will choose our normal top 3 winners for this part of the challenge and the winner will receive a free download. CHALLENGE 2: Our second challenge is the blog hop - if you hop along with us this week you will have lots of chances to win a great free download and fabulous candy whoop whoop!!! 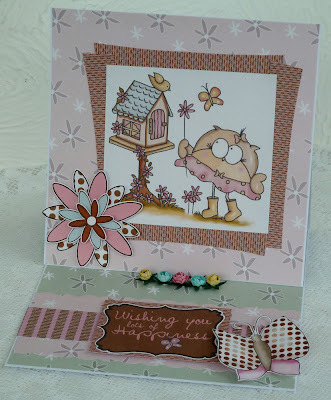 The top 3 entries into the blog hop will ALL win a free Double Sprinkles of Kraft CD worth £16!! If you've never taken part in a blog hop before it's easy peasy...all you need to do is visit each blog in turn and for this hop each Polkadoodler will give you a WORD. Now add all the words together when you finish and the sentence will actually give you the instructions for what you need to do to complete this week's challenge! The list for the Polkadoodlers who are taking place is below - make sure you hop in order as the words that you collect will form a sentence for you. I'm not going to say any more - just hop in order!! From here you need to hop to Enfys who will start with the first word of the sentence. Good luck! If you get lost, just come back here and start again. The Design Team is spread across a number of different time zones and although we have syncronised watches, there may be a slight delay. Good luck with the challenge and blog hop! Both end at 12noon GMT on Sunday 5 June. Don't forget to tune into Create and Craft on Sat 28th May at 11am and 3pm to join Nikky - she has some great demo's lined up and she will also be on your screens Tuesday 31st at 9pm right through till 9pm on Wednesday ; ) hint hint!! Now, onto the Design Team inspiration! Ruth: I've used the Father's Day download and made a word book! I've cut out the large letters from the download and then traced them onto some thick acetate which has been embossed. I've dotted a line around the edge with a Sharpies marker and that is about it! Audrey For this project I used the new Polka Doodles Father's Day/Family Download Kit. I love this kit so much! I used the paer for the edges and top of the box. I inked the edges with S.U. Soft Suede Ink. I used the Father's Day embellishment for the top. I printed it out twice and used 3D Dots to give it some dimension and I used Stickles around the scalloped circle for some bling. Saskia - A bottle of good red wine... isn't that the perfect present for Dad?! I used the Fathers Day/Family Download Kit to decorate the bottle and to make the tag! Colette I used the Fathers Day/Family Download Kit and made a stair stepper card, I printed the DAD letters then use as templates to cut the word out of some of the patterned papers. I added a letter to each step of the stair to spell the word dad, added a couple of the sentiment panels from the download and a verse that I found somewhere on the internet. A couple of brads and some gold glitter finished off the card. 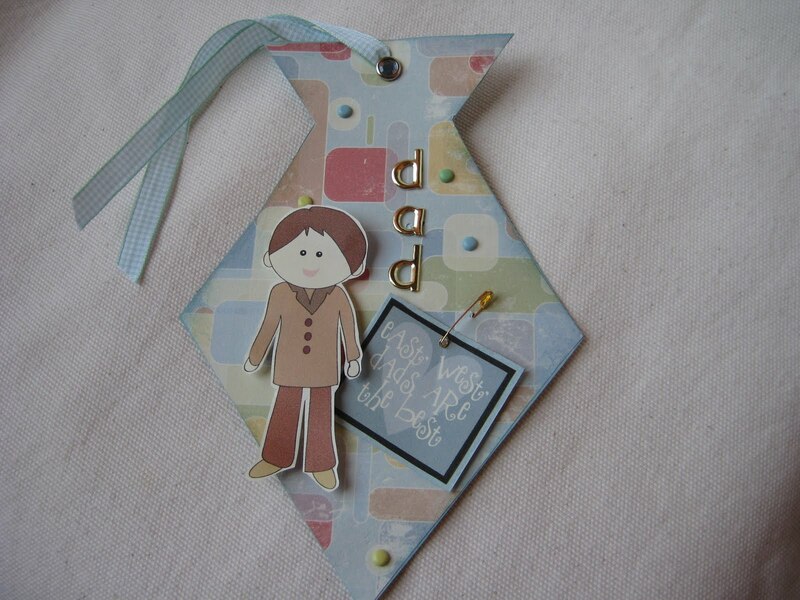 Josie: This week I also used the lush Fathers Day / Family Download Kit. I chose 3 different papers from the kit and one of the sentiments. I then printed out the male character and did lots of matting and layering! I couldn't not add some glitter too! 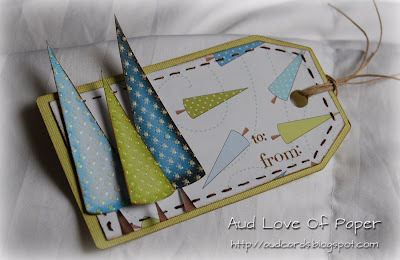 Claire I have created a gift card holder for a very popular voucher using the Fathers day Download kit, only added a little inking and some stickles! 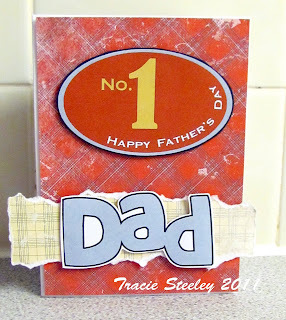 D'Anne - I created a Father's day card using the Polka Doodles Father's Day/Family Download Kit. I used 3 of the pattern papers from the kit. I layered the center element three times and the saying twice. Enjoy the hop! Fliss - In common with everyone else I've used the Fathers Day/Family Download Kit and in my case just the papers and the sentiment as I wanted to make a vintage style card (the dads in my case being pensioners!). I found a gorgeous vintage gent on his bike on the Not For Girls CD and a certain Queen song popped into my head so you can see where my inspiration came from. I rounded lots of corners and inked all the edges. 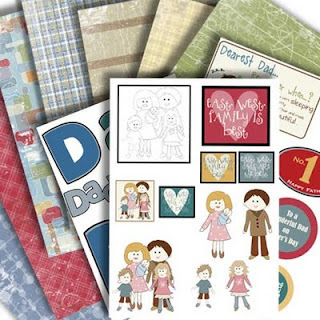 Lou: I have used the "Fathers Day / Family" downloadable kit from Polka Doodles for all the papers on my card, plus on all the stars. However the robot toppers/ elements are from the "NOT for girls" CD. Teague's name has been made using left over rub-on letters from various alphabet sheets and they have been mounted onto "Fathers Day / Family" papers. A little manly twine for an added embellishment . . . only because ribbon wouldn't do and my card is finished. 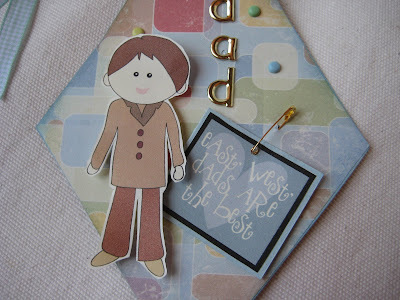 Miria This week I made a tie-tag for father's day: when I saw this paper on Polka Doodles Father's Day/Family Download Kit. it immediately reminded me of a patterned tie! 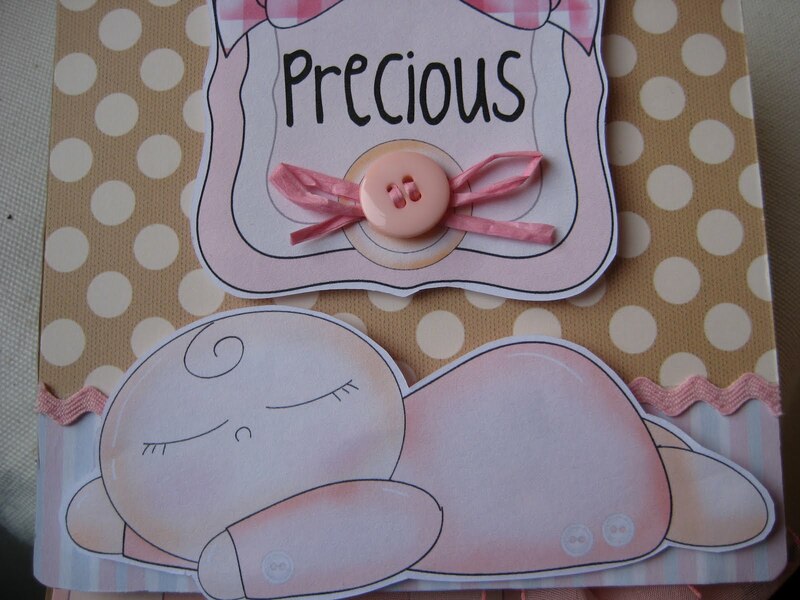 I used the sentiment and the image from the same CD and added some brads and a diaper pin - so easy-peasy! Enfys: I used the download papers (love them) to make this shirt card for Father's Day - the collar and tie were cut with my Cricut and the Designers Calender cartridge. I added some faux stitching and a couple of metal buttons. Emma Hi there, I have used Nikky's fab download too, just love the colours of these papers. I just made a simple little wall plaque, the back is covered in the red paper too where I added my sentiments also. Just added a bit of twine and a button. 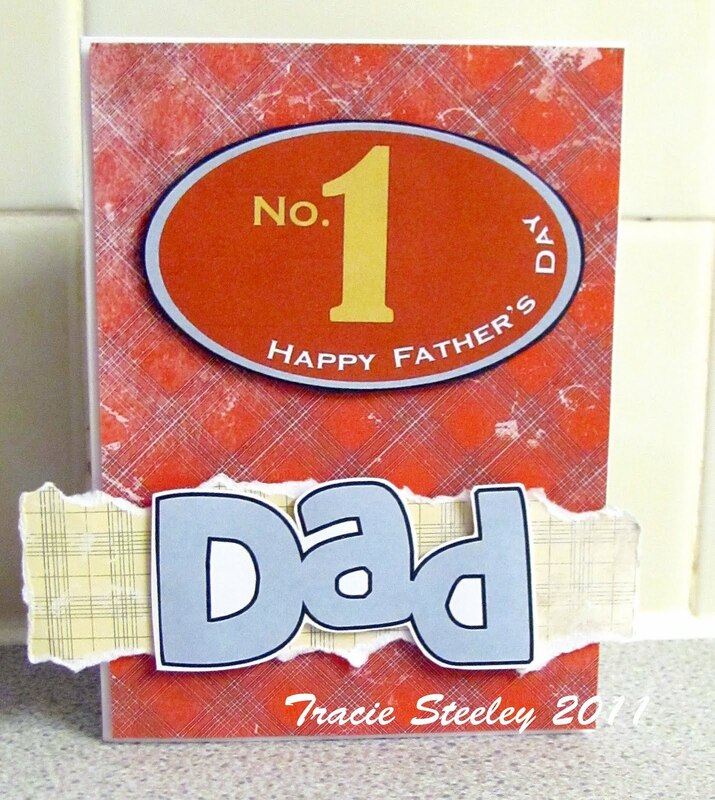 Tracie : I used the download to make my simple fathers day card. I love that you can rustle up a quick card using just whats in the download files! Hi, Nikky here, I also used the download to make this really quick and easy card. I love the distressing on these papers but also the little Dad really makes me chuckle, he looks like my dad when I was a kid, complete with naff 1970's brown yucky jacket LOLOL. 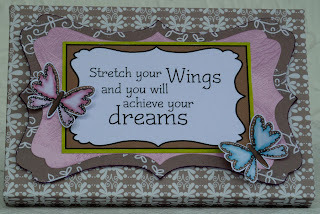 Good luck with the challenge and blog hop - closing date for both is 12noon GMT on Sunday 5 June. Hello everyone, Fliss here and it's time for another challenge at Polka Doodles but before I tell you about it there's some rather exciting news. Don't forget to join us next week as we have an extra special challenge and blog hop! You won't want to miss it so mark your diaries now, there will be loads of candy up for grabs and some extra goodies on offer too as it will be our Anniversary!! So be there or be square! Also, if you're in West Yorkshire this weekend head over to Samuel Taylors at Brighouse on Saturday 21st to see Nikky demo'ing all day and she will also be in Preston at Hunkydory Crafts' Weekend Extravaganza on Sunday too (I believe there will be lots of celeb demonstrators there too!). Congratulations! Please email Nikky for your blinkies! The first placed winner receives a download and please put add in the subject field of your email your placing and the challenge number - this will make Nikky's life a lot easier! The challenge this week is to make anything you like except a card and I can't wait to see what you all come up with. The DT have come up with some fabulous ideas with a wide variety of projects so read on to be inspired! Good luck with the challenge - you have until Sunday 29 May at 12noon GMT to enter and please don't forget our rules! Audrey For this Christmas tag I used the super fun Sundae Of Seasons CD. I cut out the trees and inked the edges with S.U. Soft Suede ink and used Glosy Accents on the snowflakes on the trees. I also used 3D Dots to make them pop. I sewed around the edges with dark brown floss and used a stamp from Michaels for the "To and From". D'Anne - Today, I wanted to share my cute gift bag with you. The digital pattern paper and sentiment are from the Double Sprinkle of Kraft cd. Notice the 3-d flower? You too, can make one by punching out 2-five petal flowers. Then pinch the tips of each flower petal. Do this to both flowers. Next, layer the flowers by off setting the petals. Punch a center and then layer a frosted pearl. 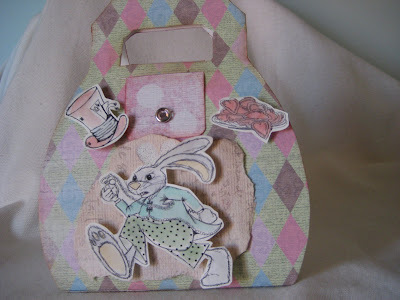 Emma Hello there, I have used the fab Wonderland rubber stamps to create my wall hanging collage. I coloured with distress ink and then went a bit mad with bits and bobs, lace, gems and glitter. Saskia - I love to read books... so never enough bookmarks! I used the images and papers from the Sugar Birdies Collectors Edition cd-rom and added some ribbon and glitter. 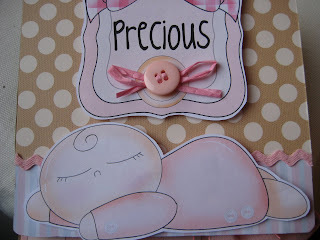 So simple to make and so cute! Colette - My project this week is a little concertina folder that has a sheet for each month of the year, on which you can jot down important dates. 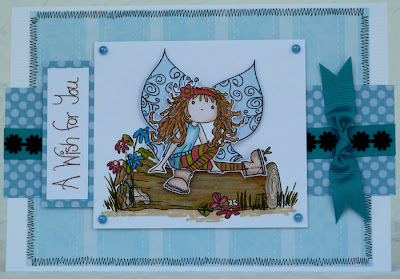 The paper and sentiment panel came from the Candy Doodles CD, and the stamps from the Magic Neighbours Stamp Set, the stamped image was coloured with Promarkers. I used Stick It magnetic tape to hold the folder closed. The ribbon embellishment came from stash. Lis-m . This week I decided to create a corner bookmark. I have never done one of these before. 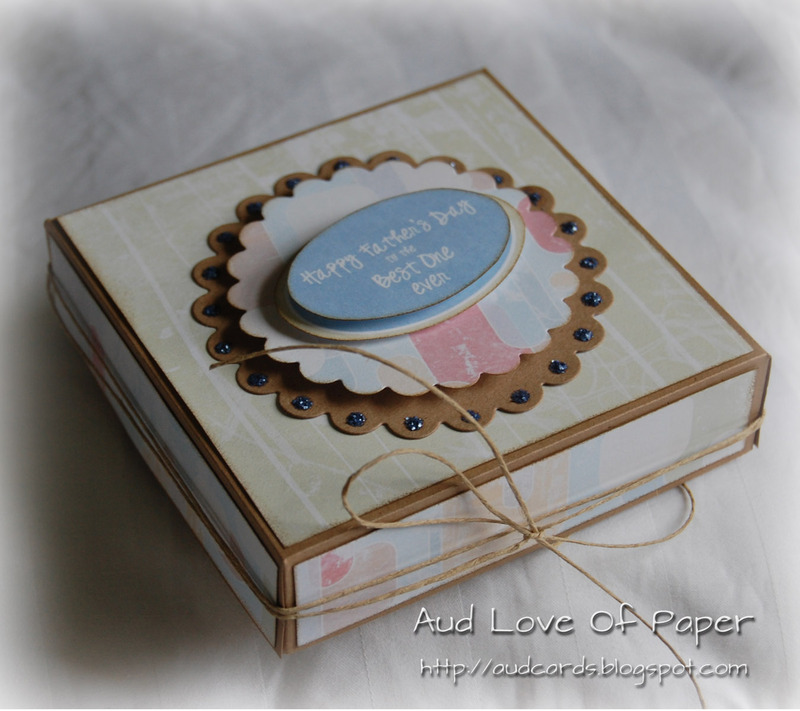 I used kraft card as my base, and papers from "All around and everywhere". 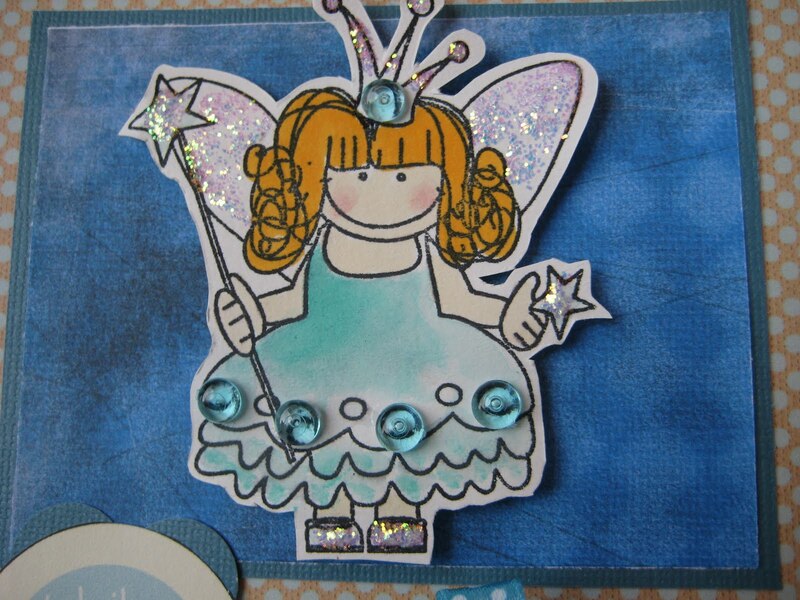 The fairy is Bevvieboo coloured with Promarkers, and sprinkled with glitter. Miria This week I made a double-sided handbag for Alice. I used a template from Paper Boutique vol.I, all the papers are from Wonderland. 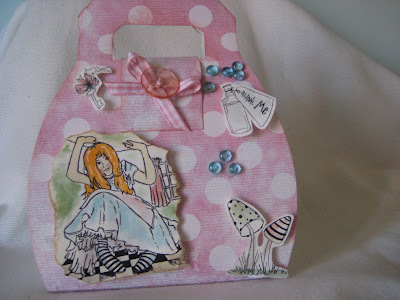 The images, coloured with Distress, are stamped with Wonderland Rubber Stamps. Claire I decided to cover my very lovely new Kraft notebook using elements from the Wonderland cd, Alice stamps and lovely ribbon from the Polkadoodles shop! Dee - I've made a tea light holder from an old used candle holder which I covered with torn pieces of mulberry paper. 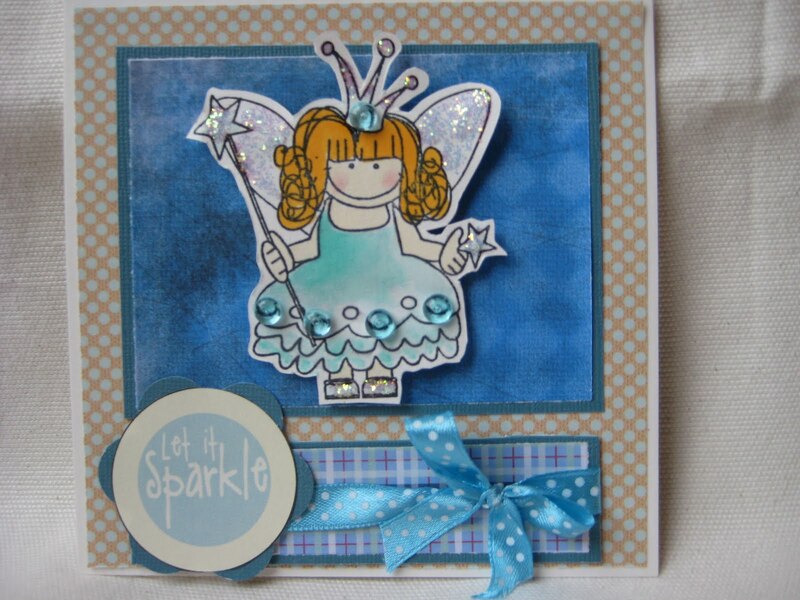 I used a fairy flutterfly stamp, Meeshelle, and aquamarkers. 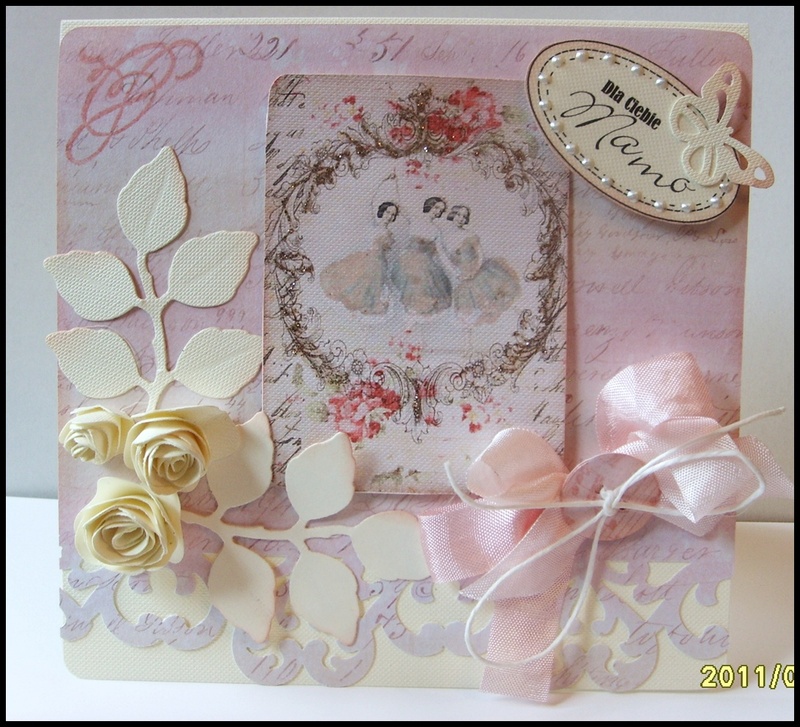 Fliss - I've made a trio of little decorative pictures with a clever box frame kit meant for photos that I found in Tescos. I printed out the papers on to the frame sheets, made them up and added embellishments. The papers, butterflies and leaves are from the Sundae Of Seasons CD and the flowers and text from the A Double Sprinkle Of Kraft CD. Lou: I've made a tag using my newest "love" . 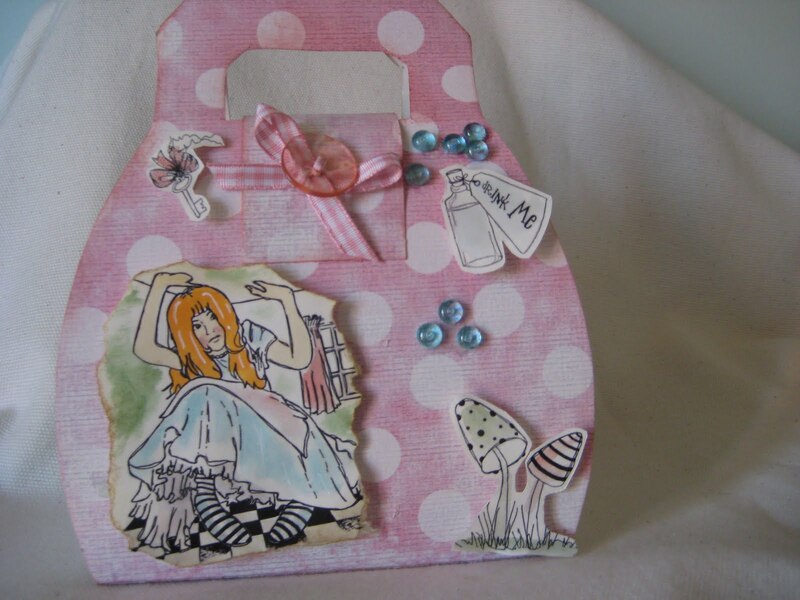 . . the Wonderland rubber stamp set. These are just so much fun to play with; getting messy and inky . . . uuuummmm heaven! The papers are also from the Wonderland CD which go beautifully (not surprisingly! lol) with the stamps. Images have been coloured with Promarkers. The cards are from an old battered deck we had in a drawer and complete my tag. Good luck with the challenge - closing date is 12noon GMT on Sunday 29 May! Apologies for the delay in this post, however it appears that Blogger has affected the whole Blogging community and we are stuggling with extra spaces and odd text too! So without further delay, here's Colette! Hi, Colette here, it’s my turn to set the theme for this week’s challenge and as I have a birthday coming up on Sunday, (one of those with a big fat zero on the end!) I have decided to give you a menu of some of my favourite things to choose from, so that I get to see lots of cards and projects that I would like on my birthday! But remember - don’t be greedy, pick only one thing from each section, so for example if you pick ribbon you cannot use any lace on your project etc., etc. Good luck with this weeks challenge - closing date is Sunday 22 May at 12noon GMT. Ruth: I've kept mine really simple this week - I've printed one of the butterflies from Sundae of Seasons four times onto some vellum, layering them with foam pads then adding the gems to the body of the butterfly. The ribbon is Stampin' Up and I've used a Martha Stewart punch. 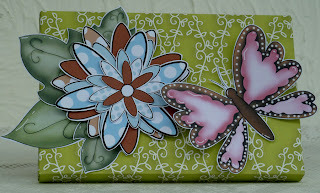 To see how the butterfly is layered, pop over to my blog! D'Anne - This was an exciting challenge. 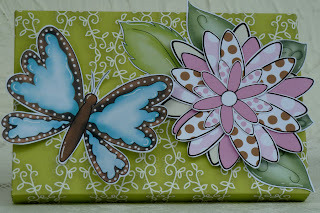 For my card I selected to use the color turquoise, lace, crystals and a butterfly. The turquoise background paper is from the Not For Girls cd, the pattern paper is from the Double Sprinkle of Kraft cd, the butterfly element is part of the 'Magical Days' collection from the All Around & Everywhere cd which I layered with 3-d dots. Then added lace and some crystal. The overall feeling is magical don't you think? Audrey For this fun challenge I chose butterflies, pink, pearls, and ribbon. I used the CD Sundae Of Seasons for the paper and the butterfly. 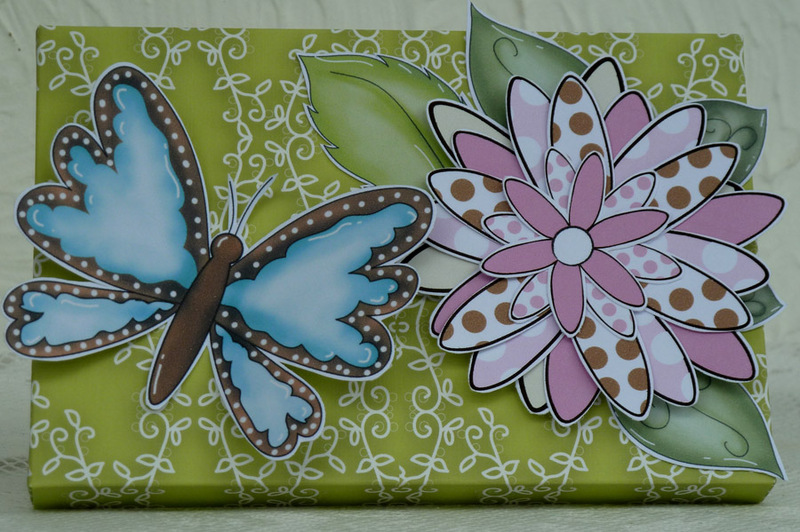 I used Inkssentials White Enamel Accents on the butterfly and 3D Dots to give it dimension. I inked the edges of the paper with S.U. Soft Suede ink and I also did some stitching with white floss as well. 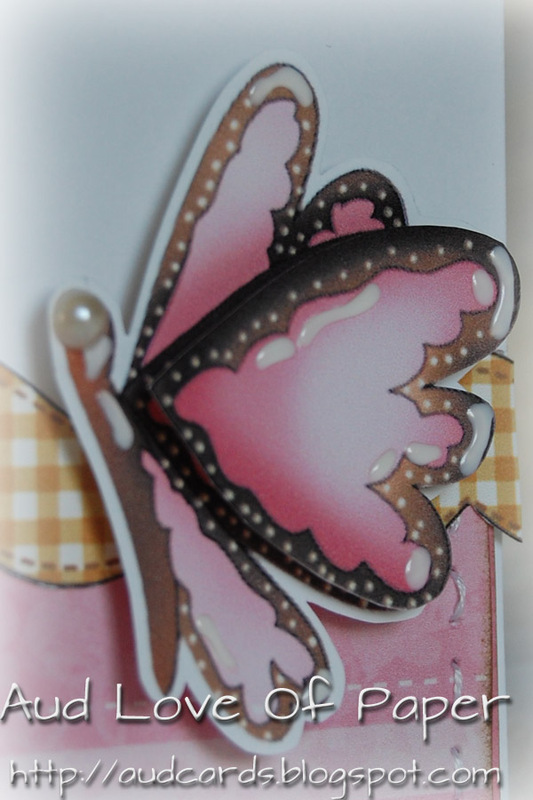 I used an off white Recollections pearl for the eye of the butterfly and added a pretty little bow at the bottom of the card. The sentiment is from the S.U. So Happy For You Set. 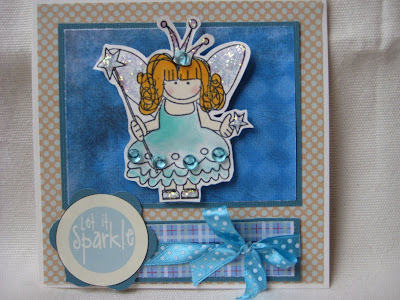 Fliss - I really enjoyed this challenge and chose turquoise, a fairy, ribbon and pearls. I inked up my favourite fairy, Gracie, and her wings and found the perfect log on which to sit her on the A Double Sprinkle Of Kraft CD. I coloured all the images with Promarkers and cut out Gracie. The stripy background paper is from the Sundae Of Seasons CD and the spotty one from the Sugar Birdies Collectors Edition. I added a sentiment from the stamp set to finish. 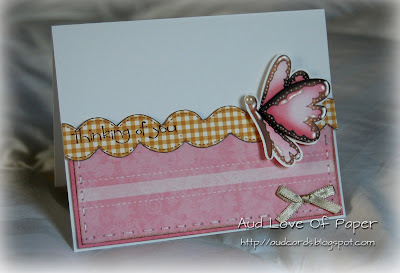 Emma - Hello there, I chose butterflies, pink, lace and pearls for my simple card. All the papers and images came from the Sundae of Seasons Cd Rom. I used liquid pearls to edge the card and sentiment. Lis-m This is a fabby challenge! 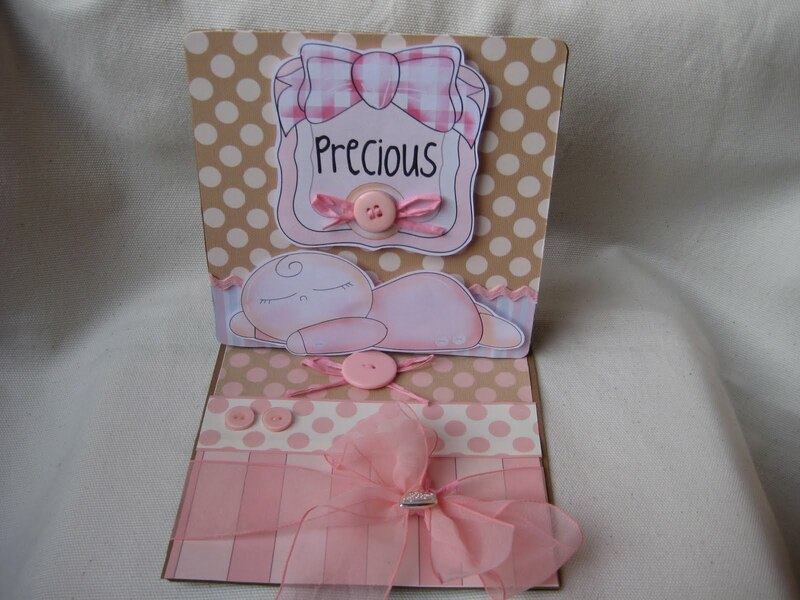 I chose pink, Fairies, Pearls and Ribbon. Papers were from "All around and everywhere", and coloured in the gorgeous "flower girl" and then added the butterfly as wings from "Meeshelle" the Flutterfly fairy! Miria My menu for this week is : fairy, turquoise, crystal, ribbon. 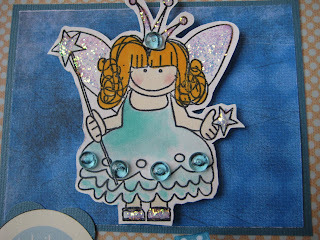 The fairy is lovely Polly,coloured with Promarkers and Distress, the crystals are dewdrops, ribbon from stash. 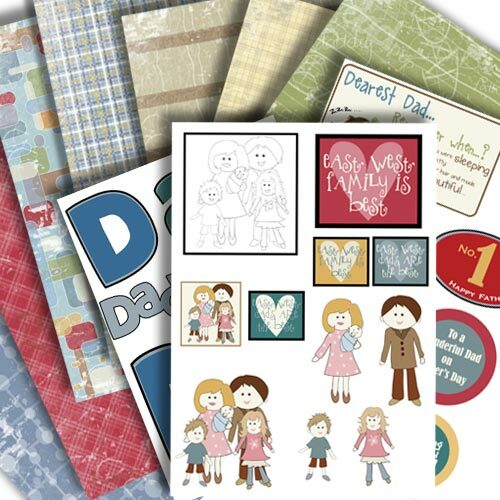 The papers and sentiment are from Double Sprinkles of Kraft and Paper Boutique III. Claire I think its fair to say we all enjoyed this one! 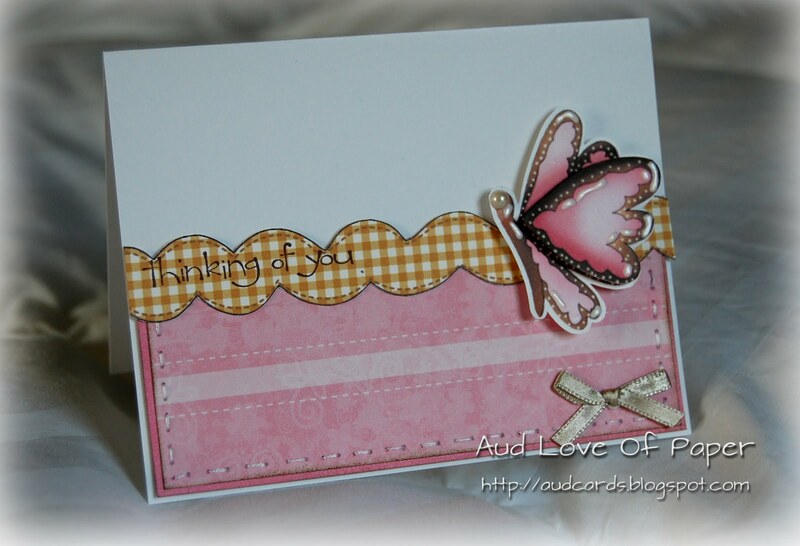 I have chosen Pink, butterfly, ribbon and crystals to create my tag. Paper is from Paper boutique Vol 1. The butterfly from A double sprinkle of Kraft as is the flower. All I have added is a large fancy eyelet, gems and ribbon! 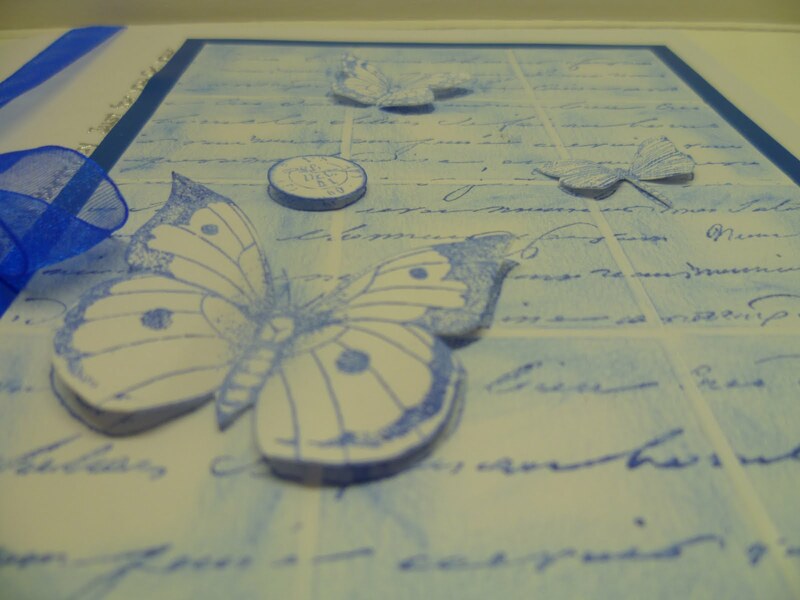 Colette For my card I have chosen turquoise – butterfly -ribbon – gems. The butterfly comes from the Sundae of Seasons CD rom and the paper and sentiment from All Around and Everywhere. Glitter, ribbon and gems are from stash. 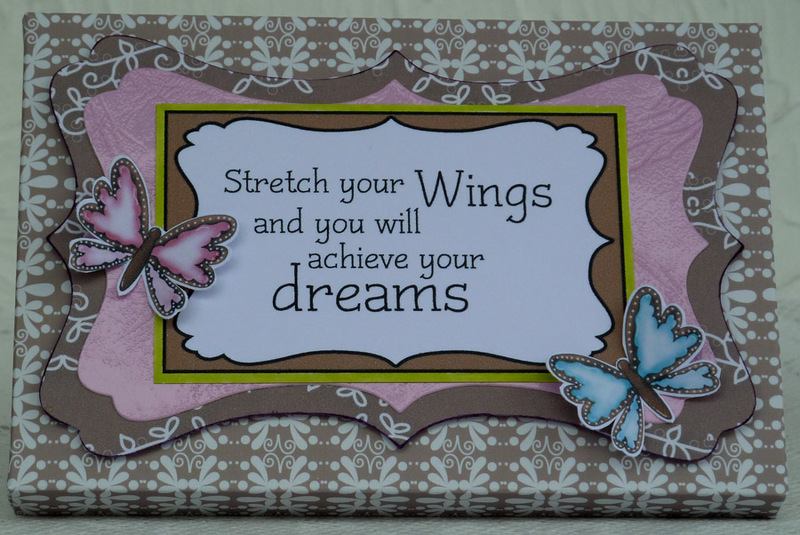 I used a Go Kreate die to create the shape of the card, printed the butterfly out twice, once on vellum, then shaped the wings and layered them up, I finished off with glitter around all the edges of the paper, the butterflies wings and even inside the card. I hope you enjoy the challenge as much as the Design Team did, we look forward to seeing all your fabulous creations. Welcome to another Polkadoodle challenge! 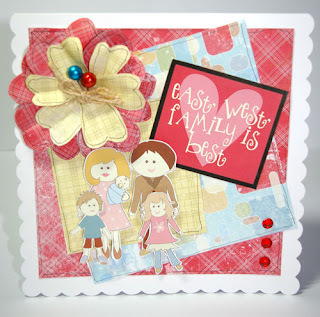 This week our host is D'Anne who has set the challenge of making an easel card! Look out for a special challenge coming up in a few weeks - you'll need to be prepared for this one so please look out for an announcement over the next week! You won't want to miss out on this! Congratulations! Please email Nikky for your blinkies! The first placed winner receives a download! Please put add in the subject field of your email your placing and the challenge number - this will make Nikky's life a lot easier! Onto the Design Team's creations! Don't forget that the challenge ends at 12noon GMT on Sunday 17 May. Good luck! Ruth: I've made my easel card with various elements from A Double Sprinkle of Kraft. The butterflies were printed as A5 and then I layered them up. The flowers I cut with my Nesties and then dampened the shapes, left them to dry whilst scrunched and then scrunched them up again once dry. Emma Hello there, for my easel, I chose to make a twisted version which seems to be popular at the moment. All the papers and images used to make this card came from the Sundae of Seasons CD rom, I just added a few pearls and some glitter glue. D'Anne - This hoot medallion style easel card was created using the digital paper and owl element from the 'Mr Twitty' collection from the Paper Boutique Vol 1 cd. I layered the owl piece several times to add dimension. Next, came some scibbles swirles and buttons. Audrey For my easel card I used Double Sprinkle Of Kraft for the paper, stamp, and sentiment. I used 3D dots for some dimension, used Glossy Accents on the flowers, butterfly and buttons and did some inking on the edges. I also did some stitching on the edges. The buttons are made from my M.S. button punch. I 'iced' the cake with Pebeo fabric paint! Fliss - My easel card uses elements all from the latest A Double Sprinkle Of Kraft CD as I so love the gorgeous papers on there. I had to use a little ingenuity to make the frame for the cute Winnie image as I only had a few bits left from before my printer problems. If you pop over to my blog, a full explanation of how I made it is there. Saskia - Working in the garden, between flowers and butterflies... isn't that great!? I used the papers and a pre-coloured image from the A Double Spinkle of Kraft cd-rom to make my easel card. Claire I too decided to have a bash at the new twisted easel cards I have been seeing in blogland, made real by a demonstration I recently went to by Beckie Dreyer. I have mostly used elements from the Double sprinkle of Kraft cd, but also one of the papers is from the Wonderland cd. I have utilised teddy on a foldaway flap to create a stop for my easel card. Teddy is coloured with promarkers , highlights created with Sakura and the lovely flower centres are created with doodle dewdrops. Colette Everything used on my easel card came from the Paper Boutique Vol III CD, the rocket is attached to a double layer strip of acetate, I used a cocktail stick coloured black with a promarker and a pearl stuck on the end to make the rockets nose. The planet was cut in half and then I stuck the two halves together using foam pads, but before joining them I attached the other end of the acetate strip to the back section of the planet with a brad. so the rocket 'flies' over the planet. Miria This week I made a classical easel card; the image and the sentiment are from cd Sundae of Seasons and the striped and dotty papers are from Double Sprinkles of Kraft. Dee: I decided to make my easel from acetate so the trees look like they are standing up by themselves. The big bee is on a spring so it stands off the card surface and wobbles when you flick it. All the elements and papers are from Sundae of Seasons CD. Sorry about the bad photo! Good luck! The challenge closes on Sunday 15 May at 12noon GMT and please remember our rules!